FLORHAM PARK, N.J. — Josh McCown has been there, done that. Actually, he’s been everywhere, done that, so the New York Jets will be in capable hands Sunday against the Buffalo Bills — rusty, but capable. But that isn’t the big story, of course. The big story is rookie Sam Darnold and how he will be affected by a strained right foot, which likely will sideline him for at least one game. First, let’s get this out of the way: It would be sheer lunacy to play Darnold — the future of the franchise — on a bad wheel. Coach Todd Bowles left open that possibility on Wednesday, saying Darnold is day-to-day. We’ll give Bowles the benefit of the doubt on this one, chalking it up to good, old-fashioned gamesmanship. Heaven knows, this isn’t a playoff game, so it makes zero sense to push him if his mobility is compromised. As for how the injury will impact Darnold’s development, nothing beats playing. The Jets are hoping the struggling rookie can play his way out of his “stupid football” funk. That’s the ideal scenario, but you know what? 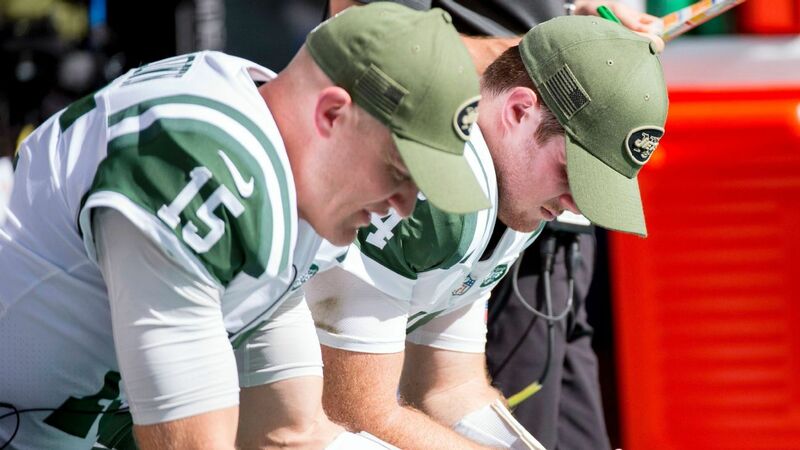 Sitting for a game or two, with the bye week sandwiched between, wouldn’t be the worst thing in the world for Darnold, who could benefit from a mental-health break. His foot isn’t the only thing strained — his confidence is too. You could hear it in his voice Monday as he beat himself up for throwing four interceptions against the Miami Dolphins. There’s nothing wrong with a brief respite. Months from now — maybe years — Darnold could look back at this injury as a blessing in disguise. A time to chill. As much as he wants to play, he acknowledged it’s “very important” not to rush back. So now the Jets turn to McCown, 39, who provided several feel-good moments last season before a season-ending hand injury in Week 13. Until the injury, it was a career year. It’s unrealistic to expect that McCown, simply because he’s been in mothballs for so long, the forgotten man in the preseason. The Jets were so focused on prepping Darnold and raising Teddy Bridgewater‘s trade value that McCown barely played — only 19 snaps in the preseason. As Darnold’s backup, McCown has received only a smattering of reps in practice, sometimes sharing his workload with Davis Webb — a developmental quarterback on the practice squad. On Wednesday, McCown took the starter’s share. His body feels wonderfully fresh because he hasn’t been hit in months, but he’s not in game condition and his timing with the receivers is nonexistent. In fact, he and Quincy Enunwa are virtual strangers on the field. Enunwa, who missed last season and most of the 2018 preseason with injuries, never has caught a ball from McCown in a game. But know this about McCown: He’s a terrific leader and he’s better than Darnold before the snap, meaning he knows how to play the cerebral game at the line of scrimmage. The Jets don’t like to talk about it, but the rookie makes a fair share of mental mistakes that have an impact on the entire offense. That won’t be the case with McCown. McCown is as rusty as Darnold’s hair color, but this doesn’t spell doom for the Jets. The old man out of the bullpen can do the job and provide cover for the rookie.